Carbon-steel frame with Triple-coated chrome for an attractive, chip-proof maintainable finish. Carbon Steel frame with Triple-coated chrome for attractive, chip-proof maintainable finish. Reinforced steel gussets at all weight-bearing points provide additional strength. Bariatric - 500 lb weight capacity. Overall Width (open): 32.5, Overall Height: 36 Seat Width: 24. Durable heavy gauge naugahyde upholstery. Padded armrests provide added user comfort. Composite Mag-style wheels are lightweight and maintenance-free. Comes standard with carry pocket in back rest. Precision sealed wheel bearings in front and rear ensure long-lasting performance and reliability. Aluminum footplates are attractive, crack-proof and lightweight. 8 front casters. Standard dual-axle provides easy transition of seat to hemi-level. Reinforced side frame, caster journal and dual crossbars. 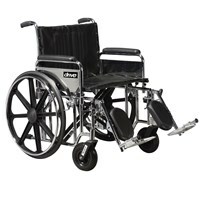 Color: black upholstery, chrome frame. Limited lifetime warranty.